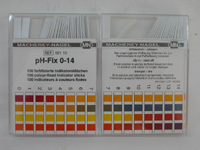 Macherey Nagel Quantofix iron test strips. 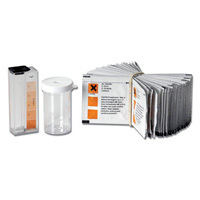 Range is 0 - 100 ppm with gradation 0, 2, 5, 10, 25, 50, 100 ppm. Vial of 100 strips. Measures Fe2+ and Fe3+. Fe2+ can be measured independently by omitting the supplied reducing agent step. 100 strips per kit.